An acrimonious divorce ended the “experiment in primitive living,” so described by Randall Henderson, editor of Desert Magazine. Marshal’s death in 1948 soon after the divorce, the refusal of his wife Tanya to grant an interview over the next 50 years of her life, and the many rumors that have abounded have combined to elicit wide speculation over the years. Today the South’s home, called by them Yaquitepec (YAKeete-PECK), lies in ruinscrumbling adobe walls, the frame for an arched doorway, a rusted bed frame, and cement and barrel cisterns once used to catch seasonal rainfall. A one-mile trail at the foot of Ghost Mountain in Blair Valley, off Highway S-2, climbs 1,200 feet to the site. The Souths had named the mountain for the “thin, ghostly trails” that led to the obscure ridge where they built their home. The hike up to the old home is a popular day trip for park visitors. Invariably, it leads to many questions about South and his familywho were they and why did they select Ghost Mountain as a homestead? Interest over the years has led to many articles about the Souths (over 40) and several website postings. What information was available was principally gleaned from Desert Magazine or other articles written by South that appeared in the Saturday Evening Post or Arizona Highways. On occasion there would be an interview with someone who knew them, but the family kept largely silent until Tanya South passed away in 1997, a few months short of her 100th birthday. Rider South, the oldest of the three children who grew up on Ghost Mountain, shared some information with a Los Angeles Times freelancer in 2002, but the information was limited. Even the family was not sure of Marshal’s past. Secrecy, changed names and dates, deliberate obfuscation, lost and burned records and letters hid the truth all these years. But there was just enough information and clues left, that slowly the story of the real Marshal South emerged. It took months of research and a team to find the answers. Kristi Hawthorne, the president of the Oceanside Historical Society, scoured the old pages of the Oceanside Blade for early information. A research team in Adelaide, South Australia, searched documents and newspapers, once it was established that South was born there and not in London, England. Family members who had not been in contact with each other searched through old letters and documents. And, finally we had the story. The man who emerged was much more complex and talented than anyone ever knew. He had been a widely-published writer of poems (over 50), short stories and essays (over 35), and novels (8) in addition to his articles and poems in Desert Magazine (102). His writings were published in South Australia, Great Britain and the United Statesin local and syndicated newspapers and magazine in New York, Pennsylvania, California, Arizona, and Texas. He was also an artist who painted watercolors and oils, made pottery, carved wood and designed iron sculptures. He did silver and leather work, weaving, and he ran his own printing press, creating booklets, greeting cards, and newsletters decorated with colored blocks hand-carved from linoleum. Marshal was born Roy Bennett Richards on February 24, 1889, in a seaside suburb of Glenelg, about six miles from the center of Adelaide, South Australia. He was raised on his father’s sheep ranch at Pandurra, about 24 miles west of Port Augusta, a farming community approximately 200 miles north of Adelaide. The landscape and climate around Pandurra was very similar to that around Ghost Mountain. It was also very isolated. Roy was a very precocious and brilliant young man who was interested in writing from an early age. He attended St. Peter’s College in Adelaide, South Australia’s most prestigious boy’s school. On December 24, 1904, the Port Augusta Dispatch published a short story that may have been his first published piecehe was 15 years old. Over the next several years the Port Augusta Dispatch and The Gadflyan Adelaide weeklypublished several short stories, poems, essays, and political commentary written by Roy Richards. Several were written under a pseudonym. Roy only attended St. Peter’s College for one year, despite the fact that his father was wealthy and could easily pay the tuition. His father wanted him to help work the many sheep ranches that he owned. Roy did not want to be a rancher; he wanted to be a writer. His mother sympathized with him, and perhaps encouraged by an unhappy marriage, she left her husband and took her two boys to the United States, arriving in 1908. For the next several years, Roy, his brother Norman, and his mother moved around quite a bitalways fearful that Charles Bennett Richards would follow them to the United States and find them. They finally settled in Oceanside in 1911. Possibly concerned that “Charlie” Richards could trace them through Roy’s publications in the United States, Roy selected the name Marshal South as his nom de plume. The decision probably came easily to him as he had used several pseudonyms while writing in Adelaide. But why the name Marshal South? There are several possibilities. Roy was a word wizard and enjoyed playing with words with double meanings. A “marshal” as a deputy or sheriff conjures up the image of a frontier marshal. But marshal also has a second meaning. As a verb, it means ushering or leading in ceremoniously. Perhaps he saw himself as taking the lead as an author of western fictionone who would one day be recognized for his writing skills. Roy always had a fascination with the American West, even in Adelaide. The setting of one of his earliest stories had been in Texas. 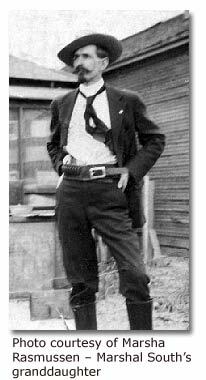 That western mystique was carried through in an early photo of him taken around 1918 in Arizona and also later for his author photo on the back of Child of Fire, published in 1935. The only thing missing from that photo was a badge. 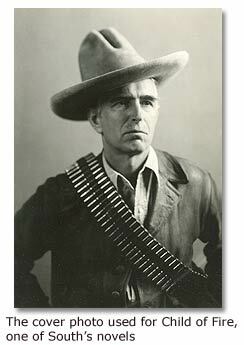 He was pictured with a western hat, leather jacket, and an ammunition belt across his chest. South may have been a reference to his fascination with the Southwest, or it could have been a reference to Australia as Terra Australissouthern landan early name for Australia. He was also from the province of South Australia. Roy’s pseudonym was just one of the ways that the family chose to hide themselves. The earliest documents they filled out listed England as their land of birth, not Australia, and all documents through the death of each one usually listed England. Marshal even listed London, England, as his birthplace on one of his documents. Birth dates and years were changed on documents or surveys as well as given names, which made it even more difficult to trace the family back to Australia. Roy changed his middle name from Bennett to Benjamin or B. Richards and dropped Roy when he was living in Oceanside. His brother Norman changed his middle name Affordhis mother’s maiden nameto Allen and listed New York as his mother’s birthplace on his wedding certificate. Annie Emma Richards, Roy’s mother, listed herself as a widow of “W.C.” Richards rather that “C.B.” Richards, the initials that Charlie always used. But before he moved to the desert with his wife Tanya in 1930 to seek a peaceful and more spiritual life, he lived a very different life, espousing military preparedness. He lived in Oceanside, California, with his mother and brother, and he worked as a clerk for a local mercantile called Hansens. His real name was Roy Bennett Richards, but in Oceanside they knew him as B. or Benjamin Richards. 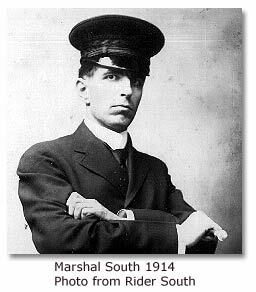 When he wasn’t working, he wrote poetry, using the name Marshal South as his nom de plume. By the spring of 1914, the editor of the Oceanside Blade was making regular comments about South’s poems, which were often reprinted in the Blade after first appearing in the Los Angeles Times. He was dubbed “Oceanside’s poet laureate” and received constant praise for his poetry. The Oceanside Blade reported on more than South’s writing ability in 1914. South had decided to take a more active role in promoting his interest in patriotism and the need for defense. His first activity was to call for a display of military arms, which were placed on view in the show windows of the Hansen store where he worked. He then called for the formation of the Oceanside Debating Club. Over 100 people attended the first meeting in December 1914 where South spoke on “National Defense and the fallacy of disarmament.” Before the meeting adjourned, a local rifle club was organized. He became impassioned about the idea of defense and began working on the organization of a Defense League. He began by calling for a meeting to complete the organization of the Oceanside Rifle Club, which became affiliated with the National Rifle Association, and enrolled those interested in military drill as members of Company A, Oceanside. South’s interest in national defense was long standing. He had written about the need for national defense as early as 1906 when he stilled lived in Australia (then he was worried about the growing threat of China and Japan). He viewed the situation in Europe in 1914 in the same light. On January 16, 1915, the Oceanside Blade stated that the American Defense League had been formed “for the encouragement of public interest in matters of national defense” and that Marshal South was elected president. By the following month members had uniforms and were drilling on a regular basis. The Blade also began referring to South only by this name and never used the name B. Richards again. The transition to Marshal South was complete. He was also now referred to as “Captain” South. In July 1915, South stepped down as president of the Rifle Club and as captain of Company A to devote more time to his duties as president of the American Defense League. That month he met with Theodore Roosevelt to discuss the policies and objectives of the league and received Roosevelt’s full support of the league activities. Just as he had all of this momentum and support for his league activities, South disengaged himself by overseeing the amalgamation of his defense league with that of the American Defense League of San Diego in December 1915. He accepted a position as the national representative of the San Diego league but did not become actively involved. During this same time period, South received national attention for his poem “Progress,” which was printed in the American Magazine and later copied in the Los Angeles Tribune and the Oceanside Blade. The editor of the Tribune stated that South is “a Californian by adoption,” and claimed that “America has found such a singer, that rarest of rare comersa true poet” in Marshal South. It was also reported in March 1916 that “Progress” had won a gold medal at the annual “elocution contest” at Erasmus Hall in Brooklyn, New York. Sometime at the end of summer 1916 South was drafted into the Army. He was sent to Camp Henry J. Jones in Douglas, Arizona, where he served with the Transportation Division of the Army Quartermaster Company (QMC). Unfortunately, his military records were burned in a massive fire in 1973 at the National Personnel Records Center in St. Louis, so the details of his service have been lost. South served while General John J. Pershing was in pursuit of Pancho Villa from 1916 to 1917. South became fully informed about the activities of the Carranzistas and the Villistas, which provided the background for several of his western novels. While he served with the QMC, he met Margaret Schweichler who worked as a civilian secretary in the QMC office with South. They courted a year before they married on January 9, 1918. That our “dignity” rests on our arms alone. That lit the fires of ruin at the last. For each capital laid waste; for each haughty flag abased. Lies the blame on heedless Peace and not on War. We may blind our eye and put the matter by. But if our armies fail usthen we die. That Peace Doves build their nests mid naked spears. Rests our only hope of long unbroken peace. The flag and liberty that is our boast. Go to Page 2 to continue The Years Before the Move to Ghost Mountain.